I posted recently about my difficulties in finding a good way to season green peas, and I’ve had the same difficulty with green beans. I’ve tried what seems like a million different ways to cook them, but they just never taste right. There is a restaurant chain in Chișinău called La Plăcinte (pronounced "pluh-chin-tay," plăcinte means pastry) that has a traditional Moldovan menu. At La Plăcinte they have some of the most incredible green beans that I’ve ever tasted, so I came home and set about trying to figure out how to re-create them myself. The recipe below is the result of my efforts, and I must say that they have gotten rave reviews from all three of us! Melt a couple of heaping tablespoonfuls of bacon grease in a large skillet over medium-high heat. Empty package of frozen green beans into skillet. Generously drizzle green beans with olive oil. Very generously. Chop onion and bacon, add to skillet. Salt and pepper to taste. I use a LOT of pepper in this- cover the beans with pepper, stir, and then cover them with pepper again. Sprinkle with Paprika. Sautee until dark and soft, stirring often. To cook from frozen, this takes about 30 minutes. Fresh would obviously take less time. Add more bacon grease or oil if it starts to get too dry. That’s it! If anybody tries this, I hope your family enjoys these as much as we do. It's definitely not the healthiest way to eat your veggies, but it is quite possibly the tastiest! That does actually sound really good. We will have to try it! I typically hate green beans, but I'm always willing to try a new recipe. I know my family will enjoy this. Green beans & bacon, are you kidding? They are going to be crazy about it. I tried this recipe and it was delicious. The paprika made it! Thanks. praying for y'all as you serve in moldova! You don't say how much bacon, or oz. of bean package. Do you use a bag, or a box of frozen beans? How many slices of bacon? Sounds good. I'd like to try it. hmm that looks similar to the one we have here. Of course nearly all the ingredients are different. this is pretty much how my gma always made green beans, it might not be the healthiest way but its the tastiest! This sounds excellent! I think I'll try the recipe soon. I usually season green beans with a little soy sauce and garlic, but I guess that's more asian-tasting. I just found your blog and I must say I'm delighted by your insightful posts. (I especially liked the piata eggs one.) I'm currently living in Romania myself (Bihor, actually) after graduating in the US and have started a similar blog, posting my personal insights as well as representative images from my travels. You didn't specify how much bacon but that's just a minor nitpick. I have always been a big fan of bacon, so I feel compelled to at least give it a try :) I'm going to whip this up for dinner tonight, looks wonderful! Well thank you so much for the compliment! I will check out your blog too, I'm eager to see what you are doing in Romania and what your observations have been, I hear the two countries are very similar! Thanks for the comments, everyone! I fixed the ingredients list so there are now quantities for the green beans and bacon. I'm so glad that some of you are already enjoying the recipe! 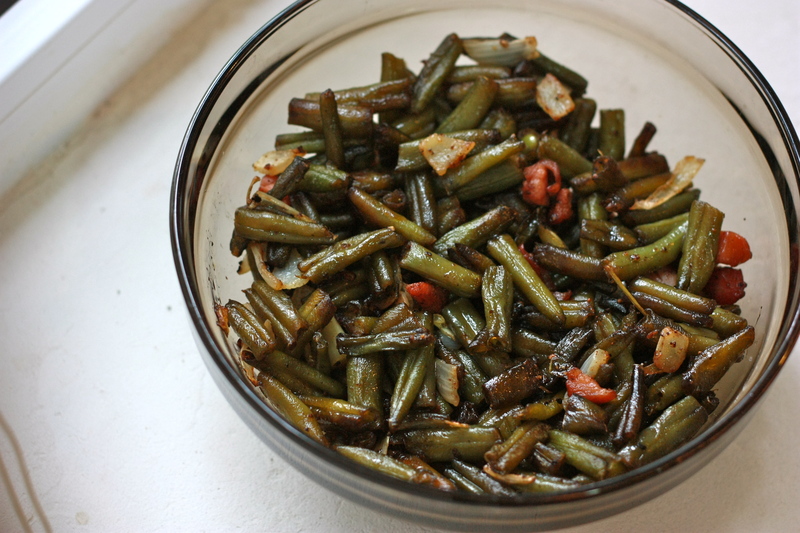 I'm a midwestern girl (central Illinois) and I make these all the time, but I know them as fried green beans. I like when everything gets really crispy. These are definitely one of my favorites! this looks really good. i was just looking for a green bean recipe to make. this may be it. You had me at Bacon Grease. You are right I love green beans and sweet peas. But finding new and interesting ways to prepare them has been a bit of a problem for me. my challenge was to find a way to make Tinned green beans (i know, ugh! - but it's a long story) taste good, and was actually able to come up with something Very simple - pour the tins(s) of green beans with their water into a pot With a tin of mushrooms and 1/2 their water, an just heat until hot (don't boil), drain really well and squeeze fresh lemon over the top. Tada! Tasty tinned beans. I am getting ready to create a website for the church I pastor and came across your blog on the front page of wordpress. I spent an entire summer working with missionaries in Chisinau 3 years ago and absolutely loved my time there. We worked in Ialoveni mostly. I would love to hear about you and your husbands work there - and possibly how to make that cornbread mush that is incredibly good :-). Paçe! These look really good. I am going to try this recipe, can't go wrong with anything involving bacon. Hi Mrs.Hutch...:) We in India, vegetarians, cook it a tad differently although most of it is the same. Instead of the bacon we dice button tomatoes and stir. It gives the curry a tangy taste. Good with tacos(in indian cuisine-rotis). Boil the beans adding a little salt to the water. Drain the beans. Dribble some olive oil in the pan and add some cumin seeds, mustard seeds and when they begin to splutter, add grated coconut and stir. For a cup of beans a quarter cup of grated coconut will do. Add the boiled and drained beans to this and add salt and pepper according to your liking(milder pepper is good). Stir intermittently till the vapour is evaporated. Ready to serve. Try it!!! You mean "mamaliga", cuvânt românesc (Romanian word) ? In the Romanian/Moldavian receipt, the green beans from the vegetables garden were first boiled. "I hear the two countries are very similar!" Actually they belong to the same country that was split in 1940 as a consequence of the Ribbentrop-Molotov (they were foreign ministers of Hitler and Stalin) pact in 1939. That pact allowed Adolf Hitler to start the second world war. Wow, that sounds really good! Bacon and beans is a winner. Other sort of very good traditional Romanian pie was ‘plăcintă cu mărar (Anethum graveolens)’. I am always looking for veggie recipes! will have to give this one a try! Keith puts a little sorgum molasses and ground red pepper in his GB's. Very tastieeee!